To win the World Cup means everything to me and it has brought me some peace, especially after what happened in 2007. We really showed that All Blacks tenacity in the final, and I was so proud to be standing there at Eden Park as a New Zealander, having so much respect for what the boys have done over the past eight years. It’s been outstanding. Winning the World Cup is something we’ve dreamed of for a while, and now we’ve achieved that dream it’s hard to find the right words to sum up my feelings. The tournament was a huge achievement for the people of New Zealand and I’m so happy for them after the way they backed the players and coaches. The players are a superb group of young New Zealanders and I really appreciate what they’ve done. Their character astounds me. I can’t say enough about the role of Richie McCaw. He’s an experienced and talented leader of this team and has developed into probably the best leader this country has ever had. You can’t buy that in the shops. You only get that from experience and he’s led this country for 60-odd Tests and got stronger and stronger. Richie is an inspiration to the rest of the team. After the final he could hardly walk. How he played with that foot injury I’ve no idea. So he’ll have some time out of the game. 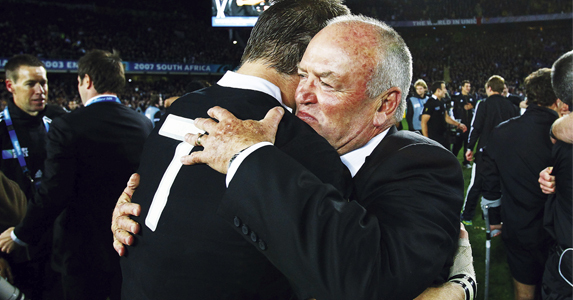 He played on heart and determination alone and this confirms him as one of the finest All Blacks ever. Winning a World Cup puts the icing on everything that he’s done. My story proves that coaches need time. Look at Sir Alex Ferguson. I know he has a pretty good team but he does pretty well, doesn’t he? There are a lot of senior people who’ve coached for a long time around the world who are very successful and I don’t think the answer is to shoot people if they don’t win. If they have talent, persevere with them. If they’ve got the ability to do the job, give them the chance to do it. You learn from your failures. How else can you learn? I was very sad for Dan Carter. He’s a special person and a special player. He wanted the stage to perform on at the peak of his career. And Stephen Donald? What a fairy tale for that guy to come on and kick the winning penalty in a World Cup final. Two weeks earlier, he was fishing for whitebait and now he’s the man. It’s special because Stephen is a top bloke and you want him to be successful because he gives his all to the team. He kicked the winning goal and he’ll live for the next 70 years on that kick. I was honoured to win the IRB Coach of the Year but that award was just a reflection of what Richie and the boys have done, alongside the special group of coaches and management teams we have. I must pay tribute to my fellow coaches, the guys who are much better than me at coaching the game. 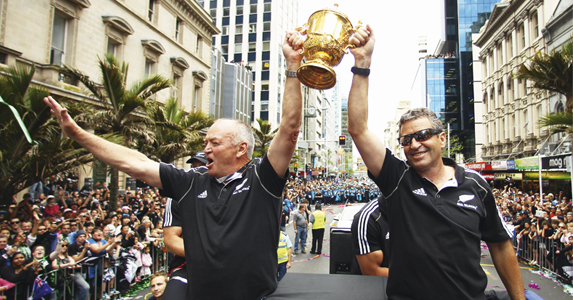 I have huge respect for what they’ve done – Wayne Smith, Steve Hansen, Mike Cron and Mick Byrne have been superb. Also Darren Shand and his management team and Nick Gill and his medical team are the best professionals I’ve ever worked with. I also wouldn’t have coached New Zealand to a World Cup final victory if it wasn’t for my wife Raewyn, who is the fourth selector! I’m now coaching the Barbarians against Australia and I also look forward to getting back to Wales and catching up with a few old mates. I’ll be a fan in the stands on 3 December when Wales play Australia.